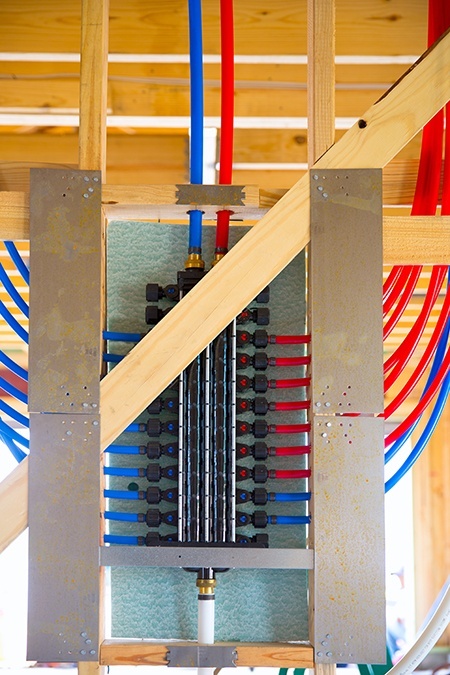 Should I use PEX piping or copper piping in my home? Unless you’re a plumber, you may not even know the difference between PEX Piping and Copper, or which piping is better for your home. Here, we hope to increase your basic knowledge of these plumbing options to help you know what you’re getting and if it’s what you truly want. Once you’ve got the basics down, you’ll know what to request from your plumber and why. Let’s start with what PEX Piping is. PEX Piping is basically cross linked polyethylene pipe. What this means is that after the material goes through several processes, it becomes durable enough to handle extreme hot or cold temperatures and what’s called “creep deformation” (that occurs from extended exposure to stress). It also resists chemical attacks from alkalines, acids and other toxins. These factors all make PEX piping an excellent piping solution for cold and hot water plumbing systems. PEX piping is also very flexible and adapts effortlessly to temperatures from below freezing all the way up to 200 degrees Fahrenheit. PEX Piping is also better for your budget. It’s an easy material for your plumber to install and with its crack resistance and fewer joints, it brings your plumbing costs down. It has fewer fittings, less chance of leaks can be used along with metal or PVC Piping, and can have a pressure balancing system. Now Copper: On the beneficial side, Copper resists corrosion and is not affected by ultraviolet rays, which means it can be useful for outside plumbing needs. This differs from PEX pipes, which can be affected by ultraviolet rays and therefore should usually not be used outside. On the downside, however, copper will corrode from the pH of the water if the water becomes too acidic or too basic for the copper pipes. Copper piping can freeze and break during winter weather, it has become more expensive and more difficult to install, raising your plumbing costs and with corrosion, the higher levels of copper seeping into your water will give your water a metallic taste. ourWe hope that these comparisons have given you a better basic understanding and knowledge of the differences between PEX and copper piping, giving you the opportunity to make the best decision for yourself. If you have any questions about PEX, please give Kost Plumbing a call.